The social networking giant is planning to launch a commercial WiFi service in India. Facebook is testing a WiFi service in rural India, allowing people with no internet connection to buy affordable data packages from their local internet service providers (ISPs) in order to access the Internet via local hotspots. 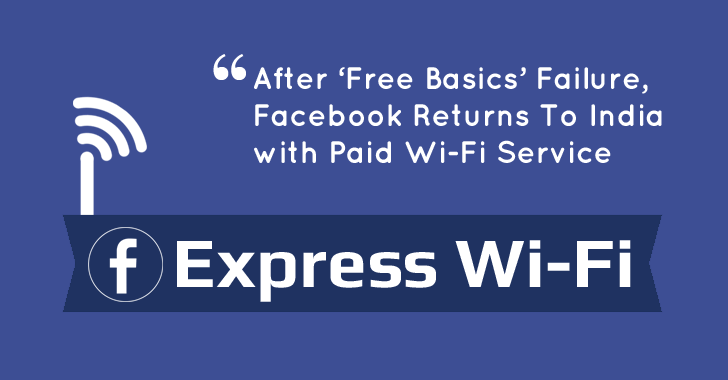 Dubbed Express Wi-Fi, the program is in sync with Mark Zuckerberg's Internet.org -- the platform Facebook used for its Free Basics to bring the Internet to all. India banned Free Basics in the country on net neutrality grounds. Net Neutrality advocates argued that by offering some websites and services for free, people are discouraged from visiting other sites. Now, Facebook has partnered with state-owned carrier Bharat Sanchar Nigam Ltd (BSNL) to expand its Express Wi-Fi program into a commercial launch, rolling out 125 rural public WiFi hotspots soon in India, the Economic Times reported today. "We are testing Express Wi-Fi program in India currently that allows customers to purchase fast, reliable and affordable data packages from their local ISP (Internet service providers) to access the Internet via local hotspots," a Facebook spokesperson told ET. If successful, Facebook’s Express Wi-Fi program has the potential to provide the Internet to a huge user base – currently, 462 Million people in India are using the Internet, but, with the lowest average connection speed among other Asian countries. Since just one-third of the whole population of the country has Internet access, India is a key market for global giants like Google and Facebook. Both the companies are going out on a limb by bringing Internet connectivity in rural areas through flying drones, high-altitude balloons, and laser beams to ready the market for its next Billion users. Last month, Facebook announced the creation of a new open-source wireless communication platform called OpenCellular, which is a doorbell-sized hardware device that can be easily deployed in remote locations by anyone.